He was President of the United States when Charlie flirted with Angels, Starsky tore around with Hutch, and Steve Austin cost $6million ($33million in today’s bionics). He’s mostly remembered for peanuts, hostages and petrol queues, but the lens of history can be a seriously dispersive prism. Jimmy Carter actually did quite a lot of good – he won the Nobel Peace Prize in the days when it was awarded to people who actually made peace in the world – but it’s probably fair to say that Number 39 has achieved more out of office than he did within (which might have something to do with the fact that, at the age of 93, he is still living the longest post-presidency in US history). god bless them, and may they make it to their 75th wedding anniversary. the world is better with them having lived in it. One thing you can say about Jimmy Carter, he always strove to be a president who represented everyone, not just his party. After reading this whole article, I can see why my dad, Edward Snyder, was so fond of Mr. Carter. They seem alot alike in their humble values. It’s a fresh breath from today’s world! Thank you for your service, Mr. President!! Yes it’s true, you can be a good man and a bad President. Jimmy Carter is a past president who makes you proud to be an American. 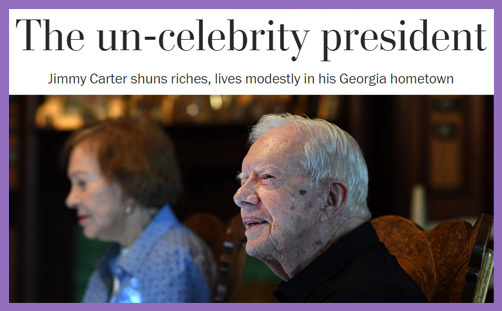 President Carter is clearly happy and at peace. It is so well deserved because he is a good man and has served our country and the world faithfully for over nine decades and still doing what he can now in this interview. No-one wishing him dead; no-one telling him to rot in hell; no-one chewed up by bitterness and partisan loathing. Jimmy Carter unifies and reconciles; he feeds the poor, houses the homeless and makes peace. He radiates true faith built on a secure foundation, determined to preach by actions more than words. His is a life manifestly directed by God, attracting others to the benefits of the gospel by his warm comfort and spiritual affection; by his obvious joy and hope for the future. In a world of ‘me, me, me’ and ‘get, get, get’, infected with a debased political narrative of doubt, despair and disgrace, how refreshing it is to be reminded that all politicians are not the self-loving same, and that one or two elevate the human spirit with sweet declarations of love and eternal blessing – enlightening, sanctifying, promising nothing but faithfulness, honesty and a divine sense of gratitude for the opportunity to serve. The saint has seen the glory of God, and his heart is captivated. What a witness for Christ Jimmy Carter is. God bless him.